CRUK was established in 1996 to manage a trust fund set up following the dissolution of the ICCO buffer stock fund. Its shareholders are FCC (Federation of Cocoa Commerce Ltd), representing the cocoa trade, and CRA Ltd representing the chocolate manufacturers. The UK Government is represented on the Board and Technical Committees. CRUK ensures that the outputs from the research it supports are easily accessible by the UK chocolate industry and the wider research community. The research usually involves a UK research institute and/or scientists in partnership with research organisations in countries which produce cocoa of importance to the UK industry. 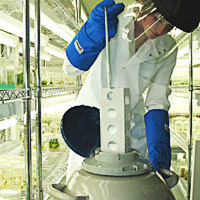 CR(UK) recognises the importance of maintaining a critical mass of researchers with an enduring interest in cocoa and has consequently placed much of its research at a small number of UK institutions such as the Universities of Reading, Aberystwyth, Greenwich and Imperial College where the expertise and facilities to study the crop are already well developed. In common with CRA and GCGRA, CRUK supports research which will lead to improved planting materials and reduce the impact of pests and diseases on the crop through sustainable technologies, but CRUK also seeks to support research on issues directly relevant to the cocoa trade. Work to ensure that the grading and handling of cocoa in commerce is based on the measurement of parameters which reflect the requirements of manufacturers and thus the ultimate consumer. "Cutting-edge research based on the shared expertise available in the UK and cocoa producing countries"